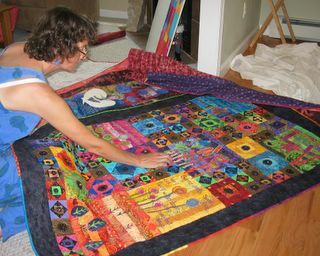 Then Kathy shared an amazing retrospective of her work. 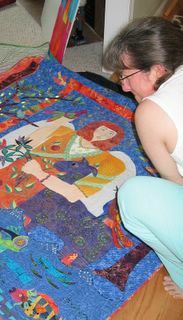 Sarah and I had not seen several of these pieces since we're fairly new to the Maine quilters community. Amazing! Wonderfully creative, full, meaningful, detailed and deliciously embellished. These pictures are not even close to real life. Look! Bundles! These are wonderful fabric origami embellishments. 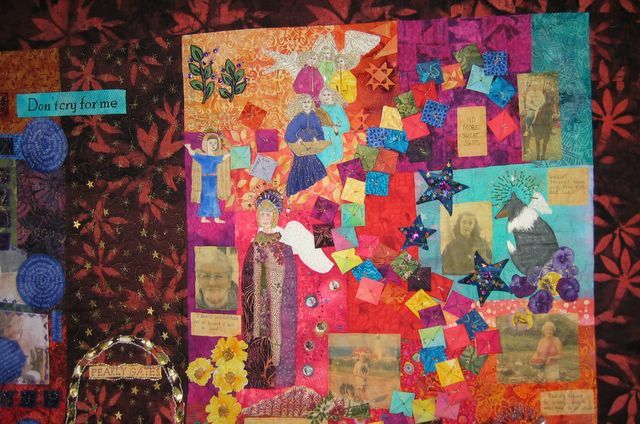 This is Kathy's alzheimers quilt. Her mother was diagnosed 15 years ago. On the darker left side, which you can't see much of, is her mother "now." It's filled with little letters to her mother about how the family is living through this experience. On the right, is Kathy's depiction of her Mother restored to her true spirit. Someday she hopes this quilt will hang in a health care facility where other families can share in her experience -- because for many many families the feelings are very similar. Here's Kate looking at Kathy's seasons quilt. Yes, that's a big pile of all of Kathy's work. She's prolific! 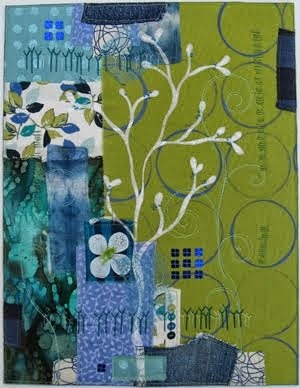 This quilt is embellished with wonderful haikus about the seasons amazingly free motioned quilted over the top. And here's Sarah looking at Kathy's angel. The fish on the bottom are inspired by a Susan Carlson class. Isn't the purple goat guy just wonderful? He is embellished with green sequined spirals! After lunch Sarah shared her latest work in progress. I don't have pictures of it because some day you're going to see it in Houston in all it's glory. She's rushing to meet the deadline. 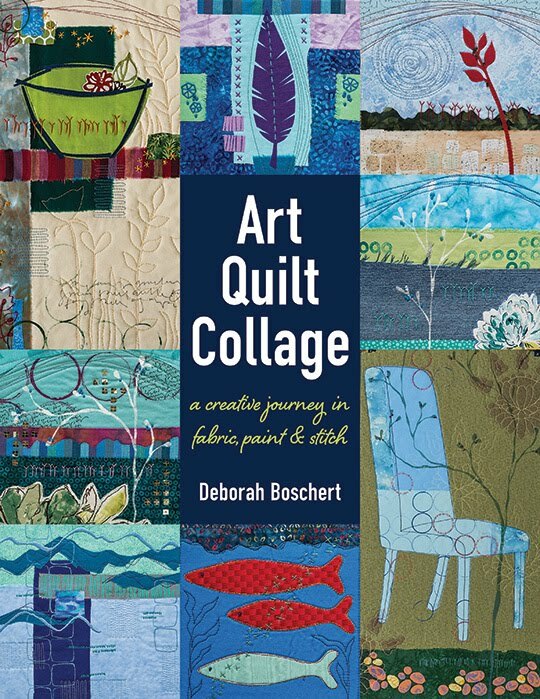 It really is totally unique and like nothing I've ever seen before -- yet grounded in many wonderful techniques that art quilters are familiar with. Maybe I could at least tell you the title... Dancing in the Solstice Winds. Isn't that lovely? Then we kicked off our new group project. We're doing a book round robin! Kathy covered a three ring binder and picked an ocean theme. Sarah used a scrapbook and picked aphrodisiac foods for her theme. 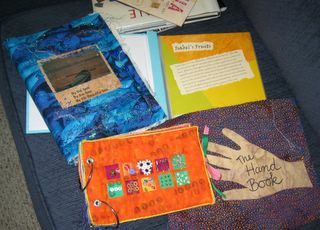 Kate created a "hand book." And I did small fabric pages and bound them with big metal rings for my numbers book. Thanks for sharing such a wonderful day with us. Makes me wish I could move back to Maine where it's all happening! What delicious work! Kathy's work is wonderful! 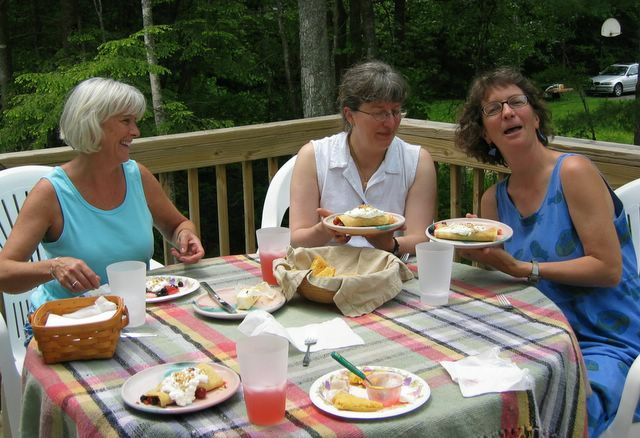 What a wonderful group of kindred spirits. I always look forward to the report of your meeting. I want to be a Frayed Edge!!! It looks like you are all having such a good time. Isn't all that energy you have after your meeting wonderful? The work looks so beautiful. I love piles and piles of work. Hey, Deborah btw...we are starting to use the same terms...I just posted on my blog and then came to read your blog and noticed three DELIGHTFUL terms that we both used. It makes me laugh!